"Our Service Outshines the Competition!" Want a closer look at the above images? CLICK HERE for gallery. 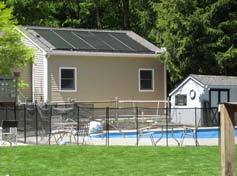 Solar Pool Heating Is The Fastest Return On Your Investment You Can Purchase. 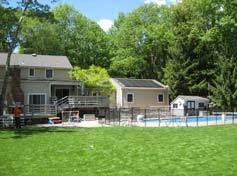 On average homeowners with a pool heater spend $500.00 to $1,000.00 per month heating their backyard pools with natural gas or electric fuel sources. That becomes $2000.00 to $4000.00 per year to enjoy the family pool. 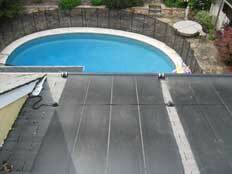 Would You Be Interested In Only Having To Pay A Fraction Of That To Heat Your Pool For The Next 10 Years? With a simple investment of what you would spend on fuel for 1 to 2 years, to heat your pool you, can purchase a solar pool heating system and never have to pay the utilities for their rising fuel prices again. These Systems Are Very Simple And Maintenance Free, Ensuring That There Is Nothing In The System That Can Breakdown. 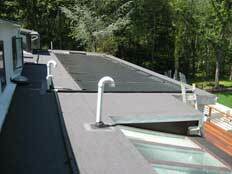 The installation of the solar pool panel on your existing roof will be lagged bolted to the roof. 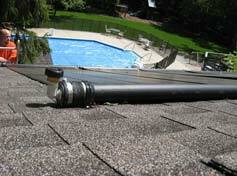 And your existing pool filter pump will circulate the pool fluid through the pool panels. It typically takes our experienced crews 1 day to install your system, allowing you to immediately enjoy the heat from the sun. 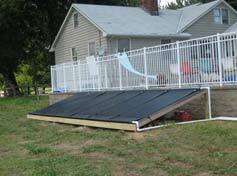 There are no additional costs to maintain this system, with the use of your existing pool pump circulating the pool water through the solar pool collectors and sending the heated water to the pool using the existing jets. There Are No Winter Freezing Issues With The Systems We Install. This is because we design the system to drain any pool water back to your pool when the system is not in use. It is very simple; just have your pool company at the time of closing out the pool in the fall to blowing out the lines. It is that easy and worry free. 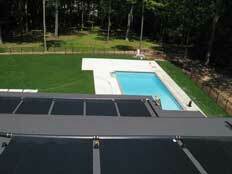 A solar pool heating system is designed by the square footage of the surface area of your pool. And the available space on the roof, of where to install the system. If these things are met, it is possible for the solar pool heaters to raise the temperature of the pool on average by 1 degree a day. A nice and sunny day may have a solar temperature gain of 5 degrees, but it is very important to understand that on the days that there is no sun that there will be no heat either. 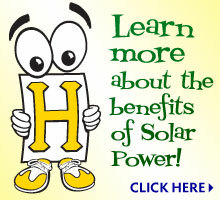 © Copyright 2008-2019 Helios Solar Energy LLC.